So, it’s been quite a roller-coaster ride of a week. Life on the Homestead tends to be like that and for the most you just have to hold on and go for it; the gut wrenching plummets are what make the views from the top all the more breath-taking. The wondrous pinnacle of this week was Farm Girl’s seventh birthday. Seven!! Where did that time go? We’re pretty into birthdays here. They’re the one day you and only you, the celebrant, get to call the shots or the tune or whatever. For that one day every year it’s all about you. 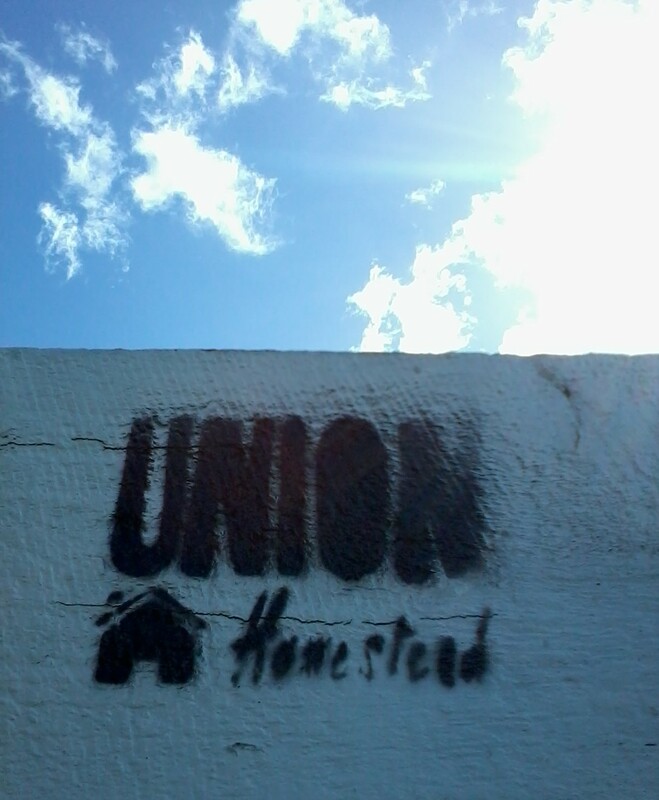 Those employed off Homestead book their annual leave each year with those six special dates in mind, and nothing that we’ve encountered thus far has been allowed to get in the way. So, what did Farm Girl want to do for the big double-oh-seven? 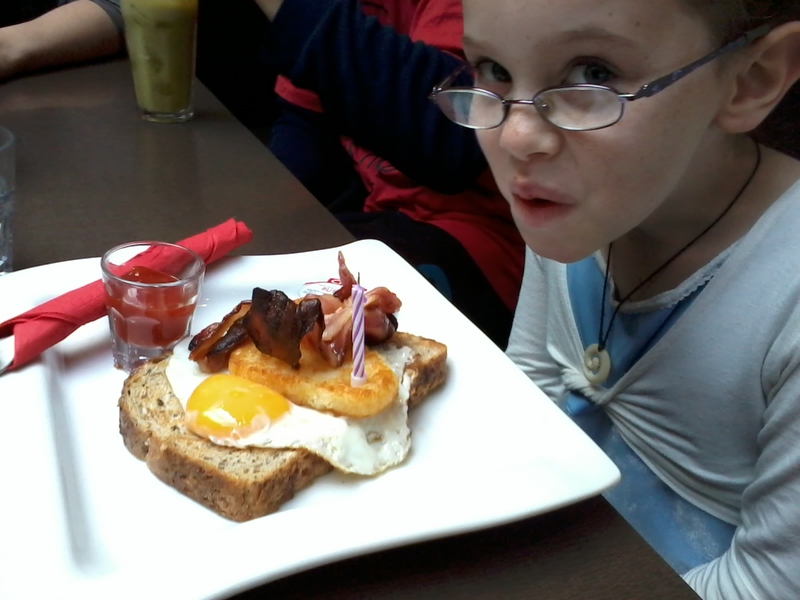 Her instructions were explicit: breakfast at Crema, celebratory chocolate cake at the farm, and fish and chips for tea. Hey, none of us were going to stand in the way of that! But first, the presents. 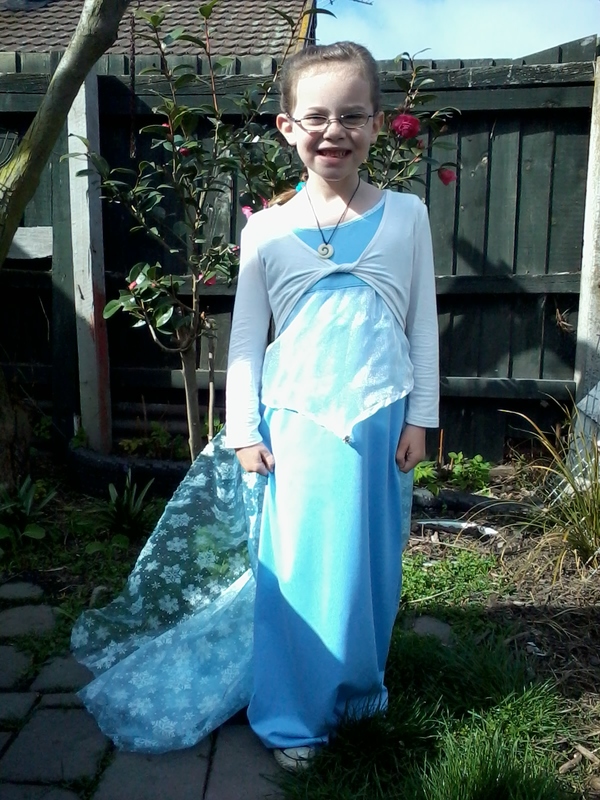 Introducing Queen Elsa, New Brighton style. Yes, the Frozen obsession continues. Despite the lack of photographic evidence (we really are a bit slack at that), the day was spent in a breathless flurry of birthday fun with cake and candles, capering with animals and cavorting with cousins, chatting and chuckling and chilling out with a continuous stream of birthday revellers. Birthdays, you can’t beat them! And what was the birthday girls highpoint? What made her day so special? Introducing the beginning of the Union-Homestead-reared milking herd: Miss Ruby. Reaching that decision was pretty much a no-brainer, in truth. It was thrashing through the next bit that caused the angst. What, we needed to clarify, would happen should a suitable home not become available for Otis? And, while we’re talking about it, what would be classed a suitable home? A suitable home, it was decided, was one where he would be free to hang out with other goatie friends; goofy grins were exchanged at the thought of our little Otis, ruling a paddock somewhere, surrounded by a harem of adoring lady friends. 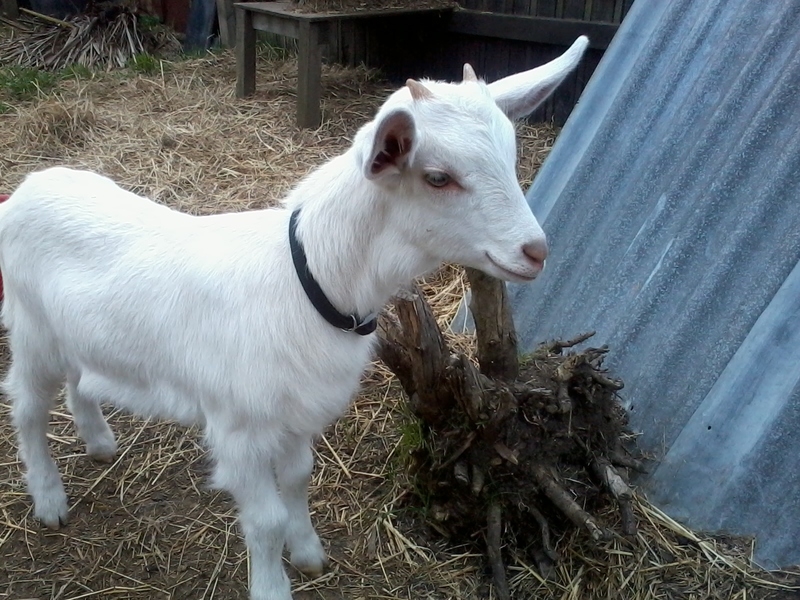 His new family would need to understand that goats need company and room, not to be tethered, and to have access to decent feed (that whole tin-can thing: it’s a myth). In a nutshell: they would need to be as smitten with goats as us. 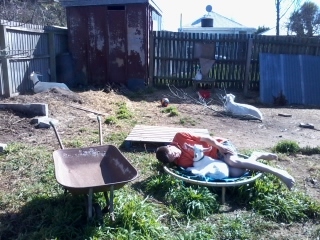 The Farmer dozes in the sun after a long week while Otis keeps guard. Is that a big ask? Time will tell, but one question on our Trade Me ad (our equivalent to E Bay) caused our goofy grins to slip slightly. Would we be willing to sell him right now, immediately, or failing that rent him out for a day to take part in a school parade? We may be an over-protective family (you certainly wouldn’t be the first to voice that sentiment), but should animals really be toys, possessions, or accessories? I can hear the farmers among you sniggering from here, but the thought of poor, bewildererd Otis (who still needs his Mum to be within maa-ing, milk-dispensing distance right now) being paraded around by folks he had no bond with made us feel a tad ill. So, if no one meets that criteria: what then? Oh, alright then. Well *ahem*, for now, *uncomfortable squirm*, in theory, *sigh*, with a thumping heart and a lump in my throat we give you the verdict of that round table discussion: he gets wethered, fattened and…you can see where this is going. Could we do it? That remains to be seen, but after this week’s happenings, surely pirate Black Bart’s motto “A short life but a merry one” far outweighs a miserable, lonely existence. While this Homesteading lark has a huge amount going for it, it also makes you stop and really examine yourself, your beliefs, your everyday behaviour. Comfort Zone? We left that waaaay down the road. 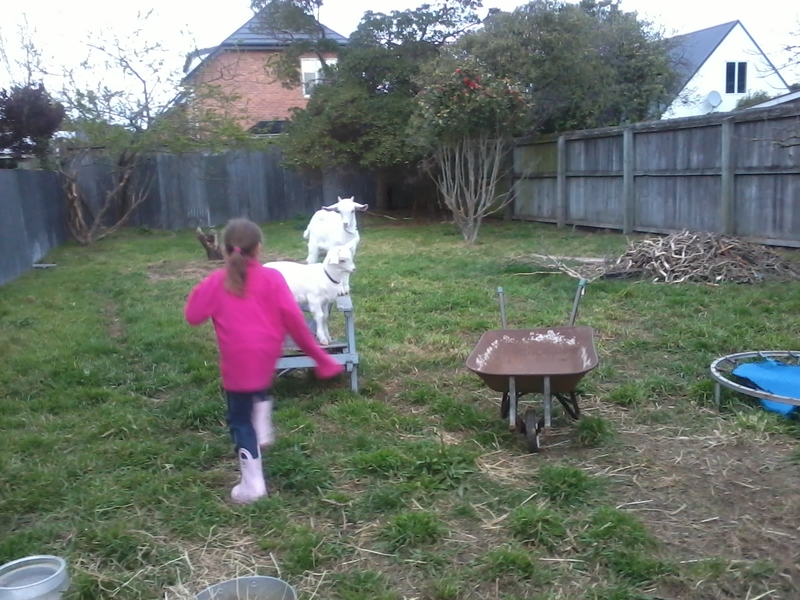 Farm Girl has taken to chanting, whilst going through her Diamond League paces with her goatie training partners, “Sell! Sell! Sell!” like a demented Wall Street stockbroker. Quietly, the rest of us have our fingers, toes, eyes and anything else crossed that her mantra works. 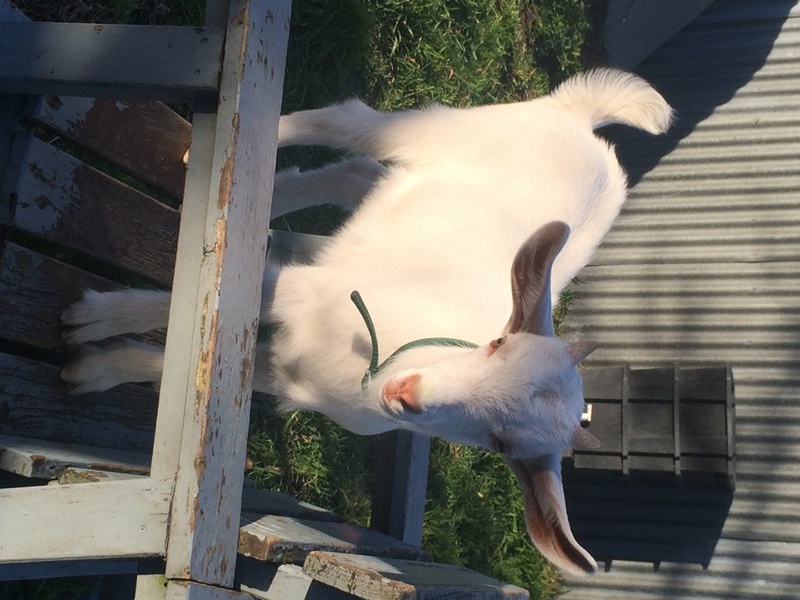 This entry was posted in Family, Goats, Union Homestead and tagged animal rights, Aotearoa, birthday, birthdays, celebration, child, children, Christchurch, Crema Cafe, Elsa, farm, farm girl, farmlet, farmstead, fattening, Frozen, goat for sale, growing up, herd management, homekill, Homestead, homesteading, kids, life, lifestock, lifestyle, lifestyle block, living, meat, microfarm, New Brighton, New Zealand, Otautahi, Peoples Independent Republic of New Brighton, PIRNB, Queen Elsa, roller coaster, Saanen, saanen goat, seven, small holding, spring, ups and downs, urban farm. Bookmark the permalink. The birthday sounds great fun and I hope something satisfactory comes up for your goat. Well now the real congrats for the Beautiful Farm Girl ( Queen Elsa eat your heart out!) I know I thought earlier she was 10…so in three years time we will get back at that! In the meantime we will support the mantra for the sale to a good home for Otis by sending many good vibes across the world. I hope a suitable seller materialises. I hope that either he sells to good home or provides many delicious meals. We were facing a similar decision if our Anna kidded but the lady turned out to be just a fatty and not a preggy goat. I’m not sure what we will do to be honest if/when she kids. We already have 2 ladies so no room for more. We fattened 2 lambs here who now reside in our freezer and it was a very hard day when we slaughtered them. A friend did the deed (he’s worked in the abbatoirs) but I was closely involved all the way. It is confrontng but the meat is so much the sweeter knowing the respect that went into it all the way. In saying that, our lambs weren’t petted and friendly like Otis. Good luck whichever way it ends up. 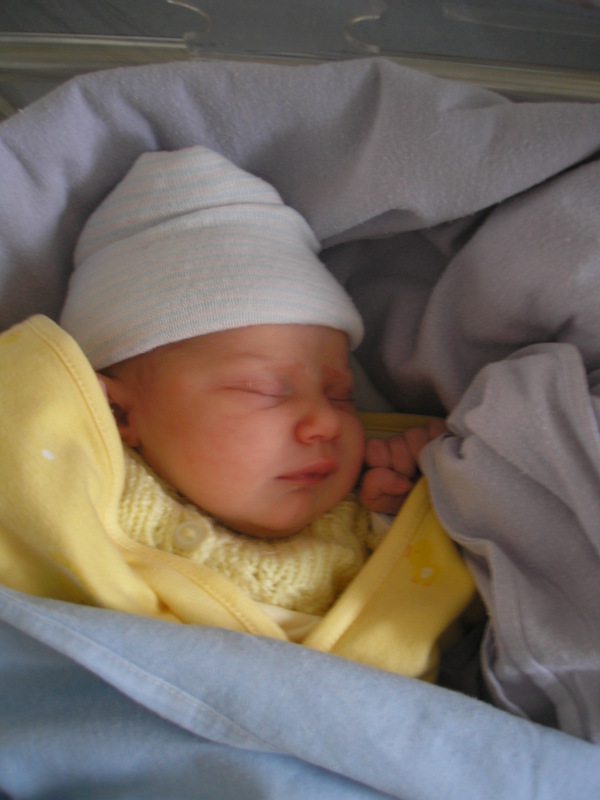 Happy birthday Queen Ailsa (she lives here in 4yo form too). Many happy returns for what sounds like was a splendid day. Thanks for both your affinity with our Otis dilemma and your Farm Girl/Queen Ailsa birthday wishes. Happy belated birthday to Farm Girl – who looked simply beautiful in the princess photo! I’m glad chocolate cake and fish and chips were in the special day – they’re the whole point of having a birthday in my opinion. I will be chanting the mantra in good faith, way up here on Vancouver Island. Seven years old was my favourite year as a child by the way – I look back on it with fondness even yet. And what is Diamond league? Soccer? My sentiments exactly re: cake (although I prefer carrot with LOTS of lemony icing) and fish and chips. Thanks for joining in the global mantra for the happy sale of Otis – of the 12 people watching the auction surely one of them will provide the happy ending we want. Ten was my favourite year as a child (I had to do a bit of indepth introspection to work that out, btw). That year everyone was friends, the next…blerk, you know how it is with girls… Diamond League http://www.diamondleague.com/en/Home/ is like the world champ of athletics in which the winners get diamonds…I think that’s it anyway. My grasp of it is sketchy to say the least, but as our very own Valerie Adams is the world wide shot put queen, The Bean Counter often slots it into the evening viewing and the lure of those sparkly diamonds has Farm Girl inspired.